ARLINGTON, Va. - In the early months of 2002, astronomers scanning the sky saw something highly unusual - and they still don't know exactly what it is. A star suddenly flashed to 600,000 times its previous brightness. For a brief time, it was the brightest star in the galaxy. As the light from the outburst spread into space, it reflected from surrounding rings of dust to reveal a spectacular, multicolored bull's eye that is now 3 light years across and still growing. "This is such an exciting discovery," said NSF-supported astronomer Sumner Starrfield of Arizona State University, one of the researchers reporting the discovery in the March 27 Nature. "It was like a light bulb going off, and you can see the light echoing off surrounding material." The new stellar outburst is described in the Nature article by an international, multi-agency team of researchers led by Howard Bond of the Space Telescope Science Institute in Baltimore, Maryland. The team presents both a novel approach to calculating our distance from the star and dramatic NASA Hubble Space Telescope images of the "light echo" as it emanates outwards. While the visual effect is stunning, the object is more than a pretty picture. Light echoes are rare, and this star's outburst has many unusual characteristics. "We don't know what has caused this to happen," said Starrfield. "This object got bigger and brighter and cooler, but we don't know why. Right now we know the effects and we're trying to use the effects to determine the cause," he said. 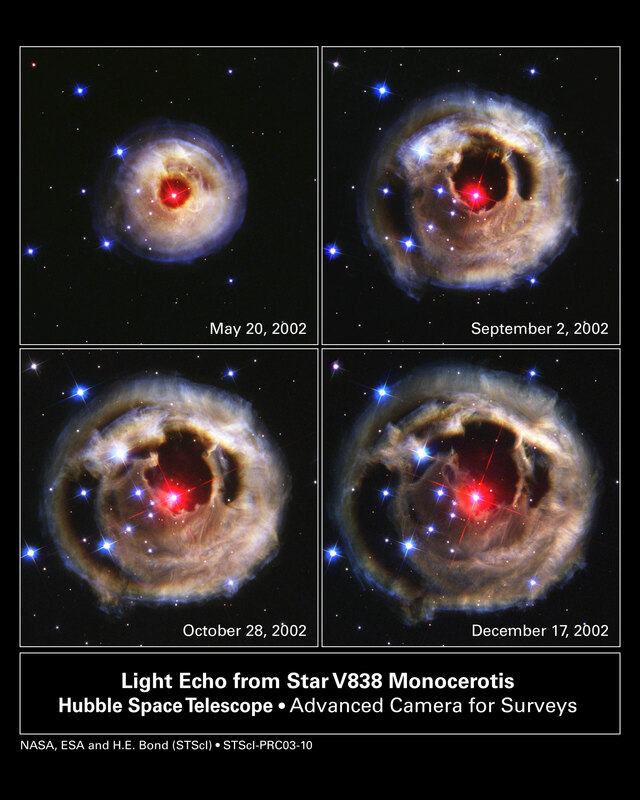 Starrfield and colleague R. Mark Wagner of the University of Arizona used ground-based telescopes to study the light from the star, named V838 Monocerotis (V838 Mon). 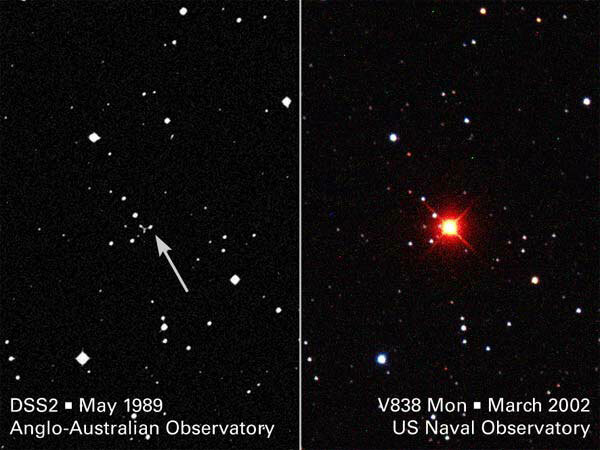 The group found that V838 Mon is actually a two-star, binary system, with one smaller and hotter (with a surface temperature of approximately 18,000 degrees Celsius) and the other star much larger and cooler (roughly 2,000 degrees Celsius). The star characteristics help the researchers determine the objects' distance from Earth, with critical data coming from both space-based images and ground-based observations. 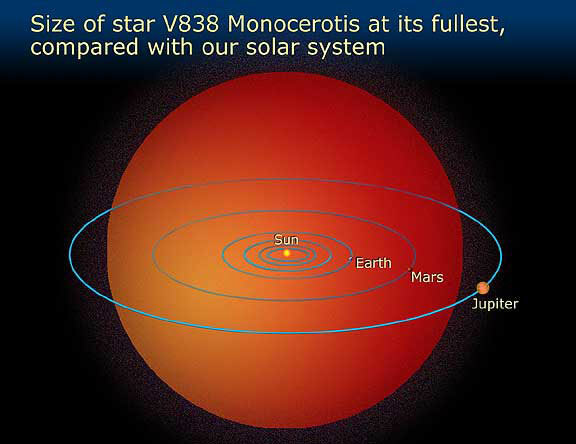 While Starrfield and his colleagues are still compiling ground-based data with NSF support, the researchers currently estimate the distance between Earth and V838 Mon to be at least 20,000 light years. 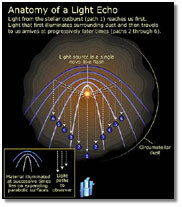 Many characteristics of the stellar outburst are unique. But, the smaller of the two stars looks similar to a well known type of star known as a B3 main sequence star, "and we know how to calculate our distance to that type of star," says Starrfield. "We know how bright such a star should be and can therefore get the distance if it is in fact similar," he added. Said Wagner, "We are getting reasonably good agreement between the distance we infer from the light echo and the distance we estimate based on our ground-based observations of the hotter star." 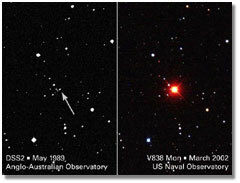 Relative to its distance, the eruption of V838 Mon was incredibly bright. "In fact, the eruption was bright enough to be seen with binoculars," said Starrfield. An additional part of the puzzle is that the outburst may be recurrent, and researchers believe the concentric envelopes of gas and dust surrounding V838 Mon may be remnants of previous outbursts, not transient debris from other star systems. Although vast amounts of light and gas were shed by the outburst, the brightening star did not completely disperse its outer layers like exploding stars known as novae. Instead, the star expanded to an enormous size, cooling at its surface so that the outermost edges are unusually cool. "If the larger of the two stars was at the center of our solar system, it would be big enough to engulf everything out to Jupiter," said Starrfield, "and it's still growing." The researchers believe that the light echo will be observable through the next decade, and they plan to use the time to make measurements with an array of space- and ground-based telescopes. "This research will likely have significant impact on our understanding of the late phases of stellar evolution," said Phil Ianna, the NSF program officer who oversees support for the project. "Once again we see how the collaborative efforts of researchers combining space-based and ground-based data reveal details about objects not even imagined before." The research team included investigators from the Space Telescope Institute in Baltimore, Maryland; the Universities Space Research Association at the U.S. Naval Observatory in Flagstaff, Arizona; the European Space Agency; Arizona State University; the Large Binocular Telescope Observatory at the University of Arizona at Tucson; the Isaac Newton Group of Telescopes in Spain's Canary Islands; and the INAF-Osservatorio Astronomico di Padova in Asiago, Italy. 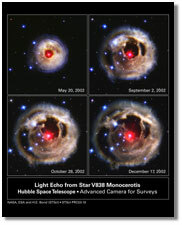 View video: Dissolve sequence of the 4 epochs of the light echo of star V838 Mon. This star was the brightest star in the galaxy for a short time. Click on link for caption. V838 Mon before and during the outburst. 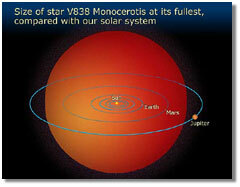 View video: This animation shows the sudden brightening of the star V838 Mon as it happened on Jan 2002. The star got much brighter because it expanded to a red super giant. In the foreground is a blue companion star.